Some opticians are failing to provide thorough eye examinations and accurate prescriptions to their customers, an investigation by Which? has found. An eye examination is not just a chance to buy new glasses; it’s also about spotting serious eye problems such as glaucoma and diabetes. But some optometrists (opticians) failed to deliver even a basic service such as thorough questioning, adequate advice and a correct prescription. One Which? researcher – whose eyes needed help to work together – was put at risk of blurred vision, left with useless glasses that would make reading difficult and driving dangerous, and was given unsuitable prescriptions on six of her eight visits. Which? sent six researchers, including two with complex eye problems, to visit 40 optometrists from large and small chains as well as some small independents. Just under a third of the visits were rated as poor or very poor by a panel of three experts. The big chains were not any better or worse over the 40 visits, the investigation found. Only one visit received an ‘excellent’ rating – an exemplary visit to a branch of Rayner Opticians. Large chain Boots/ Dollond & Aitchison had two visits rated ‘good’, two ‘ok’ and one ‘poor’, and Specsavers got one visit rated ‘good’, with two ‘ok’ and one ‘very poor’. Whereas – at the other end of the scale – small independents had three visits rated ‘good’ and one ‘poor’. Two of our six researchers did not need new glasses as their prescriptions had barely changed. Our experts criticised one branch of Boots for recommending ‘updating’ some varifocals, and one branch of Tesco for telling him his prescription had changed, which could have led to a purchase. On five visits, our researchers reported feeling some pressure to buy glasses: three were at Boots/ Dollond & Aitchison, one at Rayner, and one at an independent. Conditions such as dry and watery eyes are common, and our expert optometrists believe they should be treated seriously and the sufferer given accurate advice. One researcher with watery eyes failed to get good advice on four of his seven visits. He was told on one visit to Spescavers that it’s an ‘age thing’ and at Boots that ‘nothing can be done’ – neither is true. Another researcher with dry eyes had it properly addressed on only one of her seven visits – at Scrivens. Which? health expert Joanna Pearl asks: ‘Where does the responsibility for ensuring that consumers get a good service, no matter what branch they go into, lie? ‘The regulator, the General Optical Council, doesn’t have the power to inspect, so it’s up to companies to regulate themselves or for consumers to complain. Which? is contacting the companies to ask them about how they ensure quality and, what action they plan to take as a result of Which?’s investigation. Read about our recent lab-testing of a snapshot of high street sunglasses which includes tips on how to buy a pair that protects your eyes. 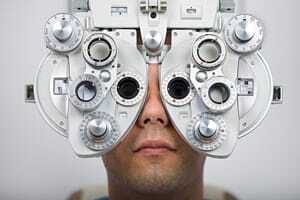 If you’re unhappy with treatment from an optician, read our full guide to making a complaint. You can compare energy prices and switch to a new gas and electricity supplier on Which? Switch. People who switched with us between 1 October and 31 December 2013 are predicted to save an average of £234 a year on their bills. For daily consumer news, subscribe to the Which? consumer news RSS feed. If you have an older web browser you may need to copy and paste https://www.which.co.uk/feeds/news.xml into your newsreader. Follow @WhichNews on Twitter for the latest news, or @WhichAction to see how we’re campaigning for consumers.